Held the third Sunday in April since 1896, Paris-Roubaix is a race of great tradition. The race's long history, coupled with its proximity to the cycling-mad triangle of northern France, Belgium, and Holland, means that it has served over the years to confirm the fame of cycling's greatest champions. 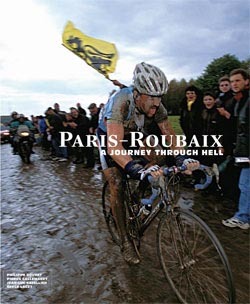 Paris-Roubaix: A Journey Through Hell is a complete exploration of this glorious race. The race will be held this year on April 12 and will follow a 270-kilometer course between the suburbs of the French capital and the northern industrial city of Roubaix. All of the history and excitement of the world's most famous one-day bicycle race is captured and comprehensively illustrated with hundreds of spectacular color and black-and-white photographs in this lavish, oversized format. With authoritative text from France's top sportswriters, Paris-Roubaix: A Journey Through Hell presents the inside story of the race, its great riders, its traditions, and its secrets. Paris-Roubaix is known as "The Hell of the North" for good reason. Though flatter than the other spring classics, it includes interminable stretches of muddy farm roads paved with rough-hewn cobblestones. The cobbles alone are enough to shake bikes and bones to bits; throw in notoriously fickle weather, which often includes rain, snow, and driving wind, and the course becomes downright treacherous. VeloPress is an endurance sports publisher focusing on the sports of cycling and triathlon, with training books that help both serious athletes and beginners build skills and fitness. VeloPress also publishes historical and biographical books that take a closer look at the celebrated icons of our sports. VeloPress books are distributed in North America to the book trade by PGW and to the bicycle trade by: AlpenBooks, American Bike Trails, American Cycling, Hawley, J&B, and QBP. In the UK, please contact Cordee at www.cordee.co.uk or +44 (0) 116 254 3579. In Australia, please contact Woodslane at www.woodslane.com.au or +61 (2) 9970 5111. Meet Bob Roll at Interbike! Belgian Beer and Bike Racing in Belgium: Come to Joe Parkin's Book Launch Party at Interbike! Graham Watson Will Be Your Personal "Tour Guide" to the Tour de France! Meet Chris Carmichael at Interbike! Meet VeloPress Authors at Interbike! Order Your 2011 Cycling, Mountain Biking, and Triathlon Calendars Today!